I had desperately wanted to quit both of my day jobs and freelance full time, there was just one thing holding me back: my lack of savings. When I decided that a $10,000 emergency fund was my magic “quit my job number” I was determined to make it work. I was only making close to $20,000, or a little more, per year at this time but I knew I’d find a way to make it happen. 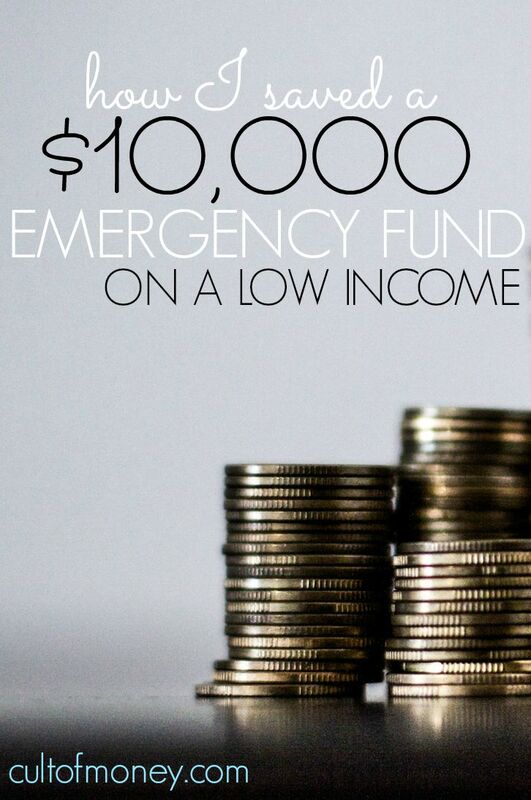 Here’s how I was able to save a large emergency fund on a low income. My first step was to prioritize my spending. I was already on a pretty strict budget but I knew there were a few more things I could do to take it even further. I bought a $10,000 trailer (took out a loan) that had a $226 monthly payment on a four year term. This one move drastically reduced my living expenses. I also set a strict grocery budget and ruthlessly adhered to it. I didn’t have cable TV and instead took advantage of my Amazon Prime membership and DVDs my girls and I had received as gifts. Entertainment was kept modest as well. I decided to have my fun on a budget! One of our go to entertainment escapes was fishing at my Dad’s pond which was 100% free for my daughters and me. Next, and probably more importantly, I started my side hustles, which later became my full-time job. I decided that I was going to make money online by writing for other people. I started out slow only charging $20 per article. Little by little I started amassing clients until I was fully booked. I saved every single penny of this extra money. It all went straight into my emergency fund. During the year that I was working hard to save I ended up getting a modest income tax refund (around $900) which went directly to my emergency fund. On top of that I was working as insurance agent and after landing my boss a very good account I got a $2,500 bonus. Once again, every single dime of that money went into savings. After I had my emergency fund built up to a decent amount I ended up quitting the day jobs in order to start my own freelance business online. That was in October of 2013. Even though I was making a low income at the time I started saving, I was determined to reach my goal. And I think that’s the key – you can accomplish anything in this world if you’re determined and willing to put in the work. What’s a goal you’ve recently accomplished?